There's one thing about going to the hospital alone - the wait time allows me to start or finish a good book. In April when I started visiting doctors to see what was up with the never ending cold that I had since the year started, I took The Watchmen with me. Many times though, I found myself not being able to concentrate on reading so I only managed a couple of chapters. This time around, Elizabeth Berg was my chosen company. 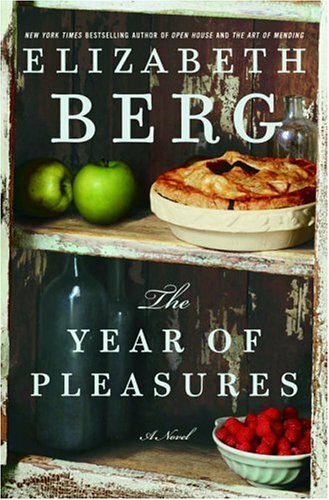 I had the book The Year of Pleasures with me when we went to Baler - it appealed to me like a book fit to read while on vacation. I thought about reading while we were on the road but it was impossible with the bumpiness of the ride, and also because I found admiring the view of the countryside a better pastime. While Alfred was taking a siesta (still at Baler), I was out at the 2nd floor verandah, put my feet up and started to read. But the cool breeze and the lightness of the surroundings just took over me. I felt that the afternoon was too beautiful to just spend on reading. So I gathered the kids who were with us and tried to do something with them instead (right before heading to the water again!). I've read Berg's True to Form and Never Change and remembered really being moved by both stories. I knew what I was in for when I picked this one up. The Year of Pleasures is about Betta Nolan who lived a very happy life with her husband John. But the novel isn't about Betta and John really, because the novel starts after his death. Betta sells their home, and then drives to the midwest in search of a new life. It's wonderful how she found her new home, made new friends, but also reconnected with old ones - friends from before she met her late husband. The book showed me that there is no single proper way to grieve the loss of a loved one. But it's also a good resource for someone who may be suffering, so that she may find strength and pleasure in everything that happens around her, even in the small things. It talked to me about dreaming too. And that it's never too late to pursue something, specially when it is what will make your heart happy and your life full. It also made me aware of how true it is for some of us women to totally lose ourselves in our relationships. Not lose in the sense that we have no identity, but... That we get too engrossed in our own little couple-world that we shut everyone else out - without meaning to. It gave me comfort that Betta reconnected with her college roommates whom she hasn't seen nor heard from in decades. They remained friends, but they never forgot her. It was amazing how they were automatically there for her when she let them know she needed them. No resentment. That's what true girlfriends are about. I fell in love with Betta's house and her new neighborhood. I could live there, I would love to live that life. I love the idea of her quaint shop - What A Woman Wants, though if it was me, I'd setup a pastry shop/bookshop. But I was also thinking how stupid it was to move in to a new place, all by yourself, and not install an alarm system! I mean Jovani (a character in the book) had a point - what if someone came in through the door and you didn't hear it? I lived in a quiet neighborhood and I was left on my own a lot of times, even when I was younger. But no matter how safe you feel, it's still better to be secured. I know that installing alarms systems is not the norm in most Philippine households, but Betta's in the States - she should know better! Haha. There are gems of wisdom in the book, but what stuck with me was a line John spoke to Betta - Don't let your habits become handcuffs. Just because you've been used to something doesn't mean you can't do it a different way or have something else entirely. Then I was also thinking, having been away from work for three days because of these flu-like symptoms, that I really don't want to work anymore. And it's not because I hate work, or that I don't like what happens at work. No. Because I was actually happy to be at work these past two weeks. Conflicting, aren't I? Hear me out. I like what I do there, but I know I could be happier doing something else. So I think that's what I'm going to work on. I will prepare my life so that I can leave and do what I really want. It's going to take a long time to get where I want to be to do this, but I will work on it. If I can make half my current month's salary doing what I love to do, I will quit my full time job. Seriously. I don't want to wait until a tragedy happens (like in Betta's case) before I find an excuse to be daring and to live the life I've been imagining for myself. I just dug through my blog archives, and you know what I've found? This book has been on my to-be-read pile since September 2008! Crazy!